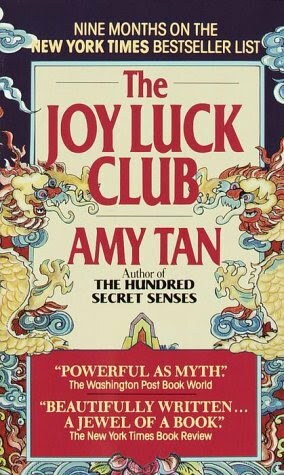 A Literary Odyssey: Book 56: The Joy Luck Club and Book Stats. This is actually a re-read for me. I read this novel as a tenth grader for school. My teacher allowed the class to pick and vote for what we would read during the year, and this novel edged out Steinbeck's The Grapes of Wrath. I still have no idea why she let us do that, since we read a lot of things the other classes weren't...and we never read some of the big things we should have. In any case, I really enjoyed this novel as a tenth grader. It was far more modern than a lot of the other things I had read in school. It can be argued that it maybe shouldn't be here, but it is hailed as a modern classic, so I am just going to accept that. I haven't read any of Tan's other novels, although I have meant to. I think I have a copy of Saving Fish from Drowning somewhere, but I've never gotten around to it. In any case, I am looking forward to revisiting this novel and seeing what I can pull from it that my 15 year old self ignored. I really liked this in high school. I should reread it! This is one that I've been wanting to read for a long time. I loved The Bonesetter's Daughter, and liked Saving Fish From Drowning. This one's on my reading list. I've never read it. If you enjoy your reread, I hope you do consider reading The Bonesetter's Daughter, my favorite of her novels. A good friend of mine is a high school teacher, and while I don't think they vote on their readings, they do read this book. She also picks a lot of other things that might be less expected. As a student, I really appreciated that teacher who was willing to go outside the norm to serve me some great literature. I think that's how I discovered Ray Bradbury and some others. I have yet to read Tan, but I have this book and several others on my shelves waiting for me. I read this one a few years ago, but when I visited San Fran for the first time last month I found myself thinking about it quite a bit. I picked this book up from the library when I was in high school. Failed to finish it, failed to return it, and then got my library card revoked. Never got another public library card until this year (12 years later). I'll always associate this book with that experience. :) But maybe now I should actually read it. My stepsister just graduated from high school and I was always so surprised at the modern books that she read. Recently Exremely Loud and Incredibly Close, which she recommended to me and I'm now reading. I read this book in college, so I think it totally counts. And it was a 300-level course, too! Oh this book is wonderful. So is everything Amy Tan writes. I hope you will like it! The Kitchen God's Wife is my favorite Tan novel so far, but I've never read The Joy Luck Club. Strange, I know, since it seems to be the most popular. Rebecca Reid: I really liked it when I read it as well. I don't remember huge portions of it, but I do remember a few key scenes. Amanda: Yeah, I can see where you would get that impression. I haven't read any of her other work, so I can't vouch for them, but this title made it on the AP Literature test, which is why it made my own list. I remember when we picked it out in high school my teacher declared it a modern classic. I'm not sure if I see that (just like I didn't agree that Proulx's The Shipping News should have that title either). Shelley: I've eyed some of her other books in the stores, but never picked them up. I might have to give them a go at some point! Jenny: I think that is what stopped me from reading any more of her work too! Amy: Oh, I will definitely add it! I try and give authors a couple of chances to wow me, so thank you for the suggestion! Andi: That is wonderful of her! We all loved this teacher because she let us pick our readings. She also introduced me to Douglas Adams, so I owe her even more for that. :) I always responded better to things that were outside the box, and I think most teenagers are like that. Avid Reader: When I visited San Fran I also thought about it! It is funny how places can remind us of certain books! Trish: Thank you for coming by! What a funny story! I am horrible at returning books on time, so I am not a big library user. I mean, I like to go and read there, but I rarely check anything out. Carin: Yeah, I think a lot of the cultural impact is why it is called a modern classic. SocrMom78: Thanks! When I read it in high school I really loved it, but we'll have to see what happens this time. I haven't read anything by Amy Tan before, but this one is on my immediate TBR list. I read this book in college too! And like Carin S., mine was also a 300-level course. It was part of a Short Story Cycle course, so I think it's important that you read it with that perspective. Each of these stories is meant to be able to be read independently. You shouldn't need a previous one to understand and enjoy it. However, when you do read them all together, you should be able to pick out the themes and messages that are carried throughout them all. If you're up for it, I recommend that you read one or two out of order first and then read the whole thing systematically. You might be surprised by what strikes you in the story when you read it as a whole versus what you noticed when you read it individually. Enjoy! Iris: I'm glad you're going to read it! It really is an excellent novel! aebither: When we read it in high school, we read it by family, which really made sense to all of us, given the names and everything. This time through I am going to read it straight through to see the differences.